A year or so ago I used to carry an enormous make up bag full of things I never ever used, but had on me at all times for those just-in-case moments. I still like to have a few things with me now, but thankfully for my shoulder/back it no longer weighs more than a small pony! Even above any make up products, I always have to have a bottle of hand sanitiser. I'm not even a big germaphobe or anything, it's mostly for when I really want to eat something when I'm out (forever hungry!) but there's nowhere to wash my hands! This is one is for children, but it smells like bubblegum so it's also for Jennie's! Hand cream isn't something I have with me all year round but in the colder months it's a must have for my hands because they get so dry. 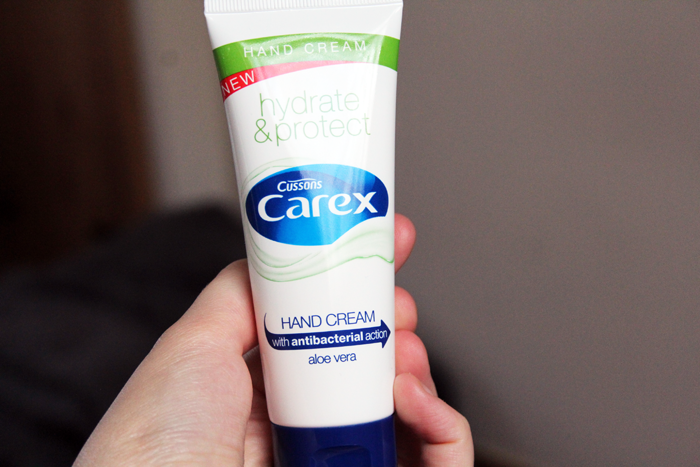 This carex hand cream* is a great handbag product because it also has some antibacterial properties. Perfect! 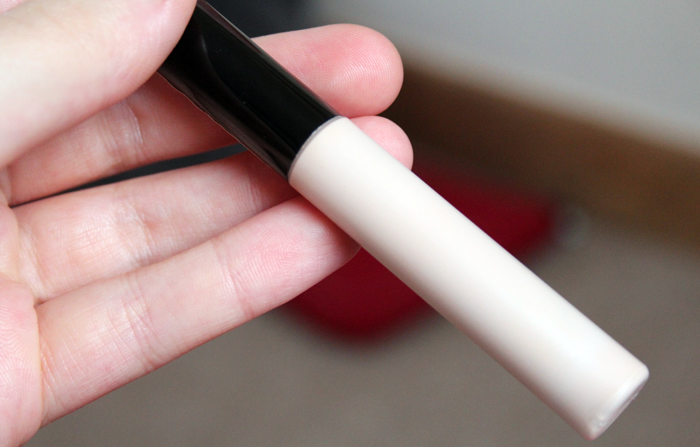 I always have a tube of the Collection Lasting Perfection concealer in my make up bag even though I rarely use it when I'm out, it's just there for emergency blemish covering really. 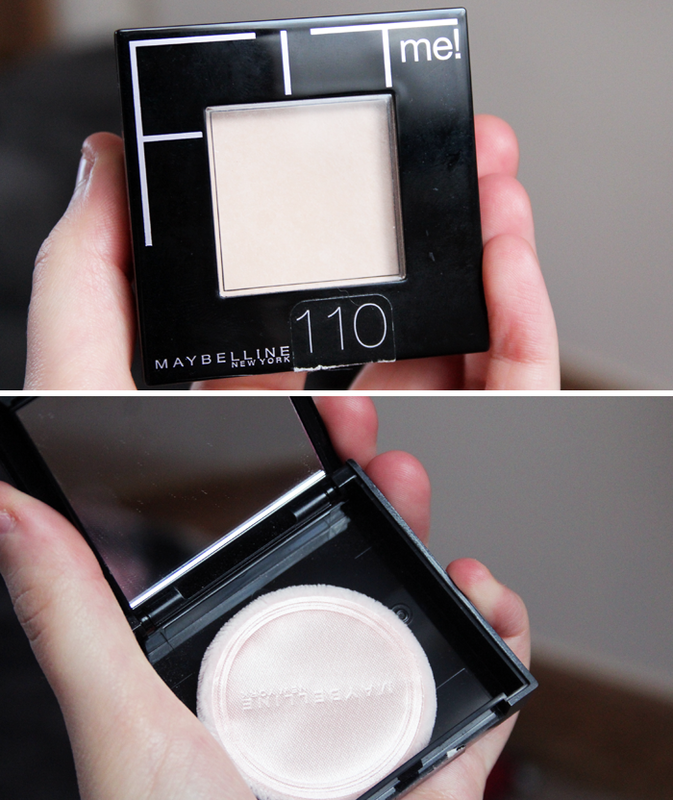 The Maybelline Fit Me powder is still my current favourite powder and the compact has a mirror inside, which is quite handy because I've successfully managed to lose all of my little compact mirrors. 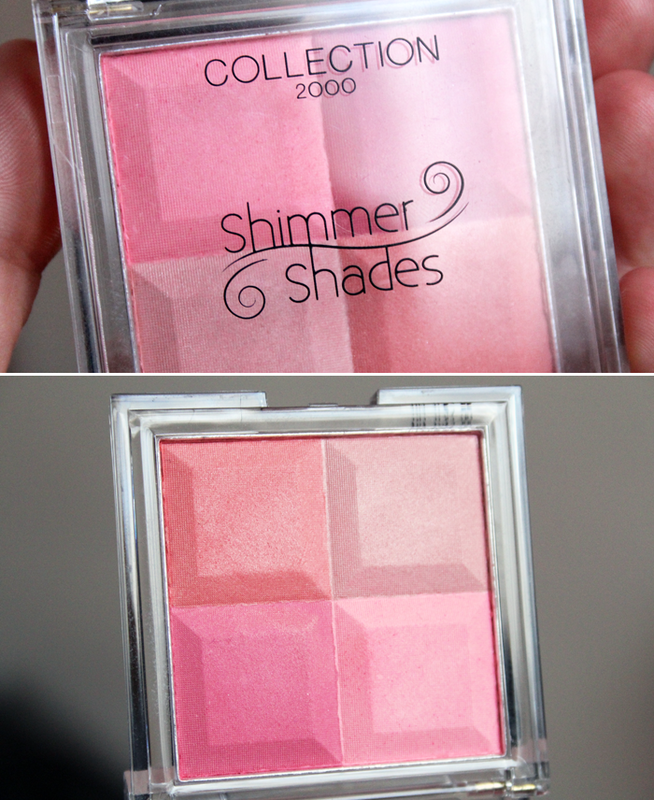 The final make up product that's a permanent addition to my make up bag is the Collection Shimmer Shades blush. I like this because it's got 4 different shades and one of them is usually fairly similar to the blush I'm wearing that day! 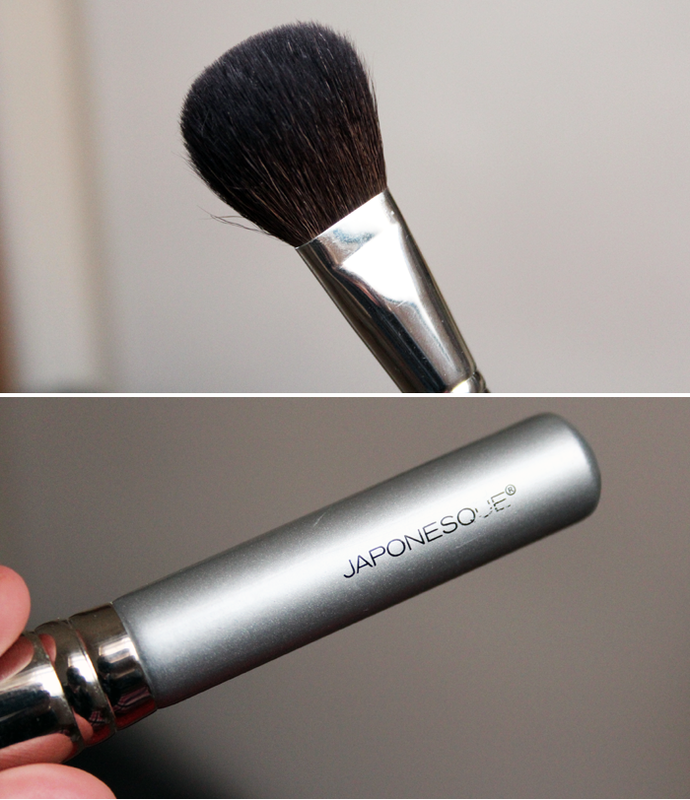 To apply my blush I have this mini Japonesque blush brush that's small enough to fit inside my make up bag without getting squashed but not so small that it's difficult to use. Finally I always like to have a few of my current favourite lip products. 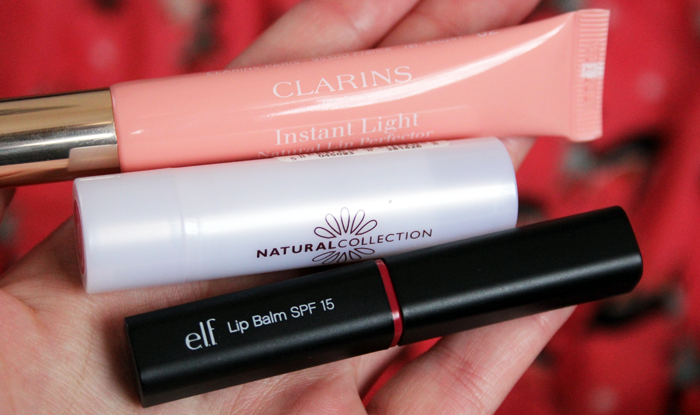 At the moment I'm still loving the Clarins Instant Light Natural Lip Perfectors as well as the Natural Collection lipstick in Pink Mallow & the ELF Lip Balm in Rose. I could totally cope with just one of these but you know, I like options! I'm a bit of a antibacterial freak and always have a gel/ foam on me. I really fancy trying that fit me powder, nearly bought the concealer last week then remembered I have three to finish first. And that shimmer shades blush looks great! 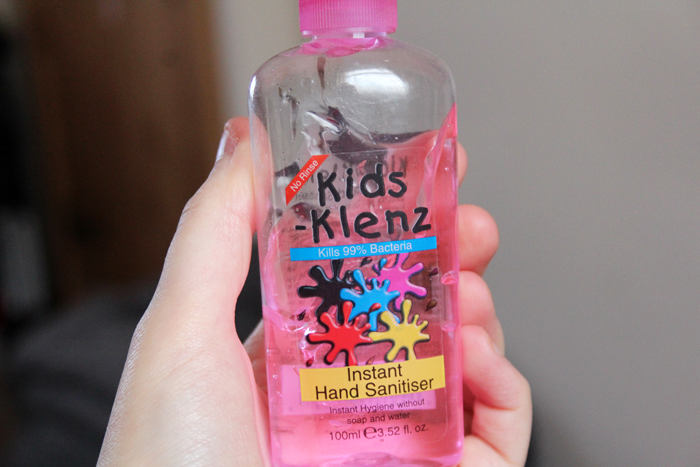 The hand sanitiser sounds lovely - why do kids get all the best scents and flavours!? hand cream is a must! as is a chapstick, or carmex! :) and tangle teezer if you have hair like mine at all...it needs to be calmed every few hours! I've never tried that maybelline powder! I'll have to give it a go! I have a few lip products in my bag too. You always need options! mirror, more lipbalms and a camouflage stick! Hi Jennie!!! :) lovely post!My handbag heroes are: a beautiful compact mirror by Cath Kidston that I bought last summer in Lake District, my Neve Cosmetics natural lipstick "Almond Cookie", a nourishing hand cream, a lip balm with propolis, which is perfect in winter days,my corrector "Coverstick by Essence",a small bottle of hand sanitiser and "Occhioni" mascara by Neve Cosmetics, which is a brand that I love!!!! Ooh I love the look of the Collection blush. Gorgeous shades! Hand cream is definitely one of my must haves! I used to get so worried about carrying everything around with me but these days tissues, hand sanitiser and whatever lip product I'm wearing is pretty much it for me most days. I love not carrying around so much stuff! Great post. It is always interesting to see which products other bloggers always have! 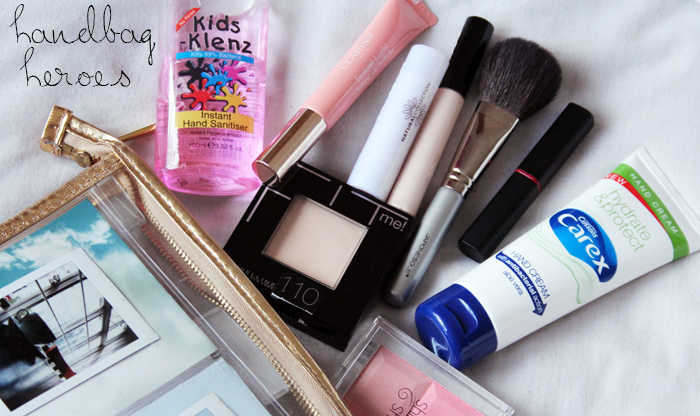 My handbag essentials mainy consist of a great deal of makeup. I really love the look of the Clarins lip perfector, it sounds perfect for Winter <3 Also I'm relieved it's not just me that gets hungry out and about, in fact a colleague remarked on my stomach rumbles the other day, how embarrassing haha! Bubblegum hand sanitizer!? Neeed! I usually hate the smell of them! Where did you get the hand sanitiser from? I work in a school so I always need this! wish I knew how to do my make up! i only carry my lipstick in my bag!! I always need hand sanitizer at school but mines plain and boring, bubblegum sounds way better! Love this post, Jennie! I have the Collection Shimmer Shades blush too and I really like it!